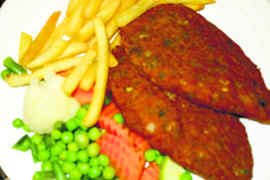 Friends who know much more tell us that cutlet was the name given to a particular cut of meat – a close cousin of the chop. However our earliest memories are associated with the ‘English’ dinner served in a Dak Bungalow, breakfasts in the Hostel Mess or Railway retiring rooms where we often encountered the cutlet in different avatars — mutton, chicken and veg. Times change and this old friend has slowly retreated into oblivion. What passes as a veg option in Shatabdi and Rajdhani breakfasts is really an apology for the real thing. More like feeble bread roll stuffed with left-over mixed veggies than what was once the pride of the Anglo-Indian table. Recently, we savored a delicious chicken cutlet at the Embassy restaurant in the Capital and cant resist the temptation to share the recipe with our readers. Beware, there is no one authentic recipe for the cutlet. So feel free to improvise and improve! Method: Put the chicken in a bowl and add the lemon juice, along with garlic-ginger pastes, all the spice powders and salt. Blend well. Then add chopped chillies, coriander and ginger. Mix well to blend. Keep the mixture in the fridge for an hour. Spread the breadcrumbs on a flat platter or tray. Bring out the chicken mince mixture and roll into small, equal-sized balls. Flatten into patties of desired shape. Dip in the beaten eggs and roll in breadcrumbs to coat evenly. Heat oil in a thick-bottomed frying pan or skillet and shallow fry of pan-grill till rich brown. Serve with sautéed vegetables or French fries. A toast or two with a bowl of soup can complete this blissful Anglo-Indian repast. Enjoy.